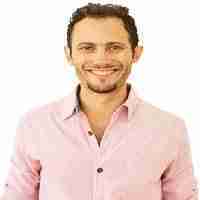 Welcome to the Steve Jobs based Join Up Dots Free Podcast Interview with Mr Noah Kagan. Noah Kagan is todays guest joining us on the Join Up Dots free podcast interview. He is a man who seems to be born to be an entrepreneur. Pure hustle muscle, flexing at its best is what he is about, mixed in with a huge amount of wanting to enjoy what he does. And it seems to me that he managed to do just that too. From starting in quite humble beginnings selling bed linen at Macey’s, Noah Kagan blossomed quickly to selling Popcorn from a stall in a shopping mall, and then working for some of the biggest most famous companies in the world. And with a resume listing Microsoft and Facebook as companies that saw the drive that he had, and the ability to work tirelessly in a chaotic environment, the sky should have been the limit for him but life had other ideas. When he was 24, he was hired as Facebook’s 30th employee. He joined the company when it was one year old; it had a few million users and was getting 50,000 new signups per day, and upon being offered employment he was given two salary options : He selected the one he wanted, and the stock options would have made him worth about $185 million today, however that was irrelevant as nine months later he was fired. And although a kick in the teeth financially, this disappointment as we see time and time again on Join Up Dots could have turned out to be the best thing that had happened to him,. He reassessed his dreams, performance and chosen path leading him now to being the Chief Sumo at AppSumo.com, an online provider of digital goods and tools such as the kind of apps, that can teach and educate on a wide range of subjects. Amazingly as we found out o this podcast interview, it was originally created in one weekend using an outsourced team in Pakistan for $60. And The New Vision That Inspires Noah? So what made him realise that this was the thing that he should focus on? And what is the different between the man he is today and the one that left Facebook quicker than he probably expected? And how come he didn’t let me into the amazing resource he has developed called Sumome.com? How he believes we should target ourselves to break down the fear we feel by visiting sites like strangerchallenge.com and making ourselves uncomfortable ! How you have to start small, and then slowly get bigger to truly gain momentum in life! Go where you enjoy. If you like using a service, then look about working with them, or taking what you like from them to create your own products! How it’s so important to recharge the batteries and take the time to get yourself back to fully prepared to rock the world! How the pre-sell concept is so vitally important to test out the potential of a new business. But is the part that so many people miss out on!